Filming 'Cap 2' in downtown Cleveland. The new trailer for Captain America 2: The Winter Soldier debuted about an hour ago – and it’s a corker. Fans will love Cap’s SHIELD uniform, our first glimpse of the Falcon in action, some Russo Brothers comedy and yet another giant piece of CGI machinery crashing, collapsing and otherwise crunching like a beer can. 0:52. Ok, we don’t get much at 52 seconds in, but we do get Anthony Mackie in the back of an SUV driving along what probably is Lakeshore Blvd. downtown. 0:58: Just after that, we cut to the Shoreway along Route 2 near what’s now First Energy Stadium. This is the big scene that shut down traffic in Cleveland and had everyone in a tizzy. 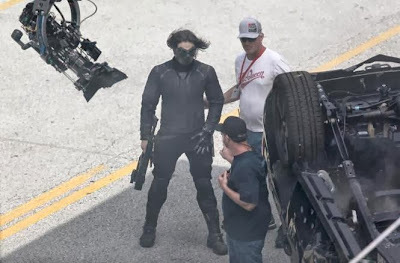 Here the Winter Soldier approaches a vehicle he just shot up. 1:09: More from that scene. This time, the Winter Soldier and his henchman continue the battle. Pretty sure that’s the Courthouse we see behind our friends (and an Ohio flag – wonder if that’ll get the CGI treatment). 1:10: The hits just keep on coming. Here’s more from the Shoreway, looking West, I’d say. Think of the work it took to cover up that billboard? Anyone remember what it was for? Local company? 1:41: Fairly certain this shot of Cap takes place under the Shoreway bridge near the Courthouse. The crew shot a couple battles under her, including one with Black Widow shooting up at the Winter Soldier. But not sure. 1:42: This is definitely downtown, though I can’t tell exactly where. Anybody know? It looks near Lakeshore, near the old Convention Center. 1:43: More Shoreway action that leads into a longer action scene that took place along Lakeshore Blvd. 2:04: Remember how I casually dismissed Cap 2 as shooting on the Fairview Bridge way back when? Well, I was wrong. Here’s that scene. What I did get right is the scene that they were likely shooting. 2:18: This is guess, but I can’t imagine the Russo’s didn’t pick a favorite spot on the east side to shoot this scene. Anybody? Anybody? As for interior locations – I’m just not sure. See any in here? Let us know!